This antibody is generated against the complete 20aa sequence of the fully processed rat NPS peptide, it should run at about 2kDa on WB. ab18252 detects mouse NPS peptide in IHC (PFA fixed) and in RIA in hypothalamic mouse brain tissue. Synthetic peptide conjugated to KLH derived from within residues 1 to the C-terminus of fully processed Rat Neuropeptide S.
Our Abpromise guarantee covers the use of ab18252 in the following tested applications. IHC (PFA fixed) Use a concentration of 0.3 µg/ml. RIA Use a concentration of 0.1 - 0.3 µg/ml. Modulates arousal and anxiety. May play an important anorexigenic role (By similarity). Binds to its receptor NPSR1 with nanomolar affinity to increase intracellular calcium concentrations (PubMed:15312648, PubMed:16790440). Immunohistochemistry (PFA fixed) - Anti-Neuropeptide S antibody (ab18252)This image is courtesy of Sophie Pezet, Univ London Kings Coll, United Kingdom. Immunofluorescent staining using the Neuropeptide S antibody (ab18252) in the rat hypothalamus. Picture taken using objectives X20 (A) or X40 (B). The staining is observed in thin and varicose fibers. This staining is blocked by preincubation with immunising peptides (ab18698 and ab18699). ab18252 was used at 1/1000 (0.3µg/ml) incubated overnight at room temperature. 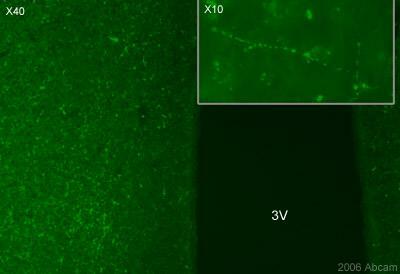 Secondary antibody used was anti-rabbit Alexa Fluor 488 at 1/1000 incubated for 2 hours at room temperature. Rat brain tissue was perfusion fixed with 4% PFA followed by overnight post-fixation in the same fixative, cryoprotected in 20% sucrose and frozen in OCT. 30µm coronal sections were cut on a cyrostat and immunohistochemistry performed by the 'free floating' technique. IC50: 46 fmoles; ab18252 used at a dilution of 1/3000; Tracer: [125I] Y10-hNPS, 12.000 cpm; Detection method: anti-rabbit SPA (Amersham). Radioimmunoassay was performed in equilibrium, using the SPA technology (Amersham). 50µl antirabbit YSi SPA beads (RPN 140) were mixed with 50µl antiserum (1:3000), 50µl tracer (12,000 cpm) and with or without cold NPS peptide in increasing concentrations. All reagents were resuspended in 0.1M phosphate buffer, pH 7, 0.1% BSA. Incubation was for 48h at RT. Bound radioligand was detected by scintillation proximity in a beta counter (MicroBeta, Wallac). Immunohistochemistry (Frozen sections) - Anti-Neuropeptide S antibody (ab18252)This image is courtesy of Xiaobin Liu. ab18252 staining Neuropeptide S in mouse brain tissue section by Immunohistochemistry (Frozen sections). Tissue samples were fixed with paraformaldehyde and blocking with 5% serum for 1 hour at 220C was performed. The sample was incubated with primary antibody (1/1000) for 10 hours at 220C. An Alexa Fluor® 555-conjugated Goat polyclonal to rabbit IgG was used as secondary antibody at 1/500 dilution. The images were generated from same slice and same area (KF, a part of LPB on mouse brain atlas). Scale bar is 200 µm on the left image and 20 µm on the right image. Blue colour represents DAPI staining, while red one is for Neuropeptide S.
Publishing research using ab18252? Please let us know so that we can cite the reference in this datasheet.